A pair of Argentinians were among five players who swept their way into the second round of the Miami Open on Wednesday. Guido Andreozzi beat Mikhail Kukushkin of Kazakhstan 7-6 (3), 6-4, and Federico Delbonis beat German Peter Gojowczyk 6-4, 6-2 as the main draw of the hardcourt tournament got underway with Round of 128 matches. Spain's Roberto Carballes Baena defeated American Denis Kudla 6-1, 6-2, and Janko Tipsarevic of Serbia beat American Bradley Klahn 6-3, 6-3 to advance. In one of the night's final matches, Poland's Hubert Hurkacz took down Italian Matteo Berrettini 6-4, 6-3 to keep the sweep theme going. The other night match, however, saw a different theme continue as Germany's Mischa Zverev got by wild card Nicola Kuhn of Spain after Kuhn retired because of cramping with the score 4-6, 7-5, 2-2. Arguably the most high-profile match of the day was also decided by injury, as Australian Bernard Tomic won on a walkover when the Czech Republic's Tomas Berdych couldn't play due to a back issue. On the second and final day of qualifying, Canadian teen Felix Auger-Aliassime advanced to the main draw as he looks to build off his third-round run in the BNP Paribas Open in Indian Wells, Calif.
Auger-Aliassime, 18, defeated Italian Paolo Lorenzi 7-6 (1), 6-2, clinching a spot in the main draw of the ATP Tour Masters 1000 event. He will next face fellow qualifier Casper Ruud of Norway in the first round. "I'm happy with the work I've done in the (qualifiers)," the 57th-ranked Auger-Aliassime told ATP Radio following his win on the hardcourts Wednesday. "My main objective coming here was to qualify because I strongly believe I deserve my place." 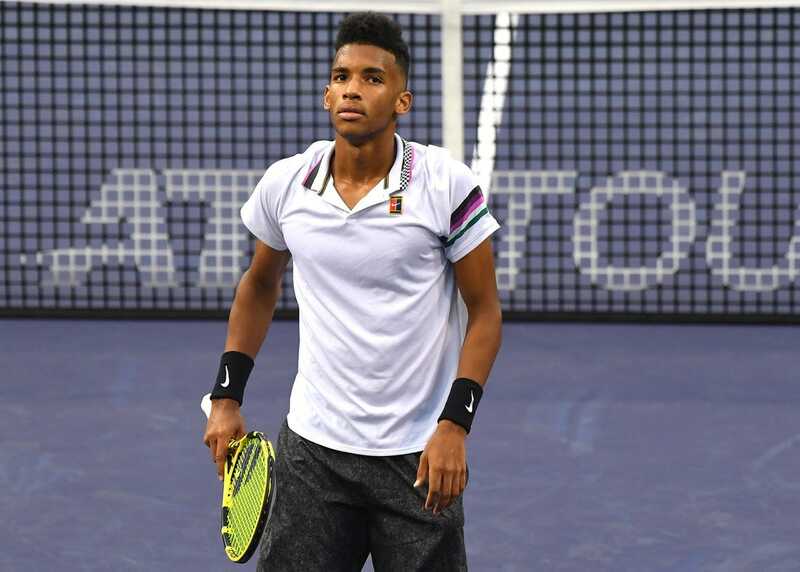 The highlight of Auger-Aliassime's run in California was his first career win over a top-10 opponent, a 6-4, 6-2 victory over 10th-ranked Stefanos Tsitsipas of Greece. The upset of Tsitsipas was all the more important when considering the young Greek player has already been to where Auger-Aliassime wants to go. The Canadian currently sits No. 4 in the ATP Race to Milan rankings -- the system used to determine who competes in November's NextGen ATP Finals in Italy. No. 1 in the rankings? Tsitsipas. The defending champion of the NextGen ATP Finals? Tsitsipas. The first- and third-ranked qualifiers also advanced, as top qualifier Radu Albot of Moldova swept American Mitchell Krueger 6-3, 7-5, and third-ranked qualifier Reilly Opelka of the United States topped Spain's Marcel Granollers 6-3, 7-6 (4). American Mackenzie McDonald, the fourth-ranked qualifier in the tournament, lost to 15th-seeded qualifier Lorenzo Sonego of Italy 7-5, 6-4. Slovakian Lukas Lacko topped Denis Istomin of Uzbekistan on a walkover.